Who is it for? 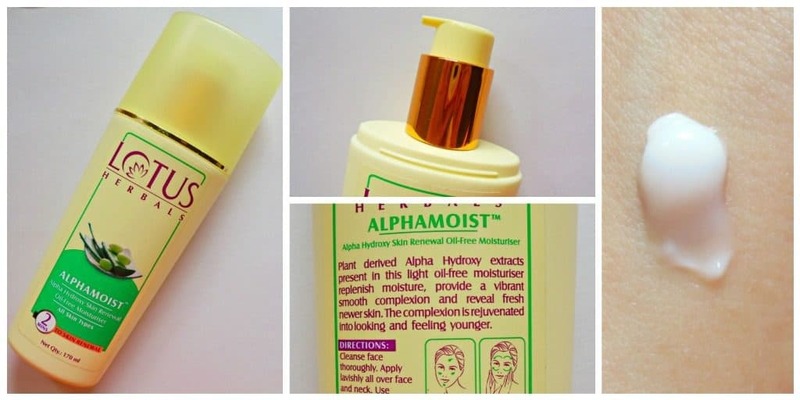 Lotus Herbals Alphamoist Alpha Hydroxy Skin Renewal Oil-Free Moisturiser is an AHA based light moisturizer for oily skin. Take 1-2 pumps of the product as per your skin’s need. Dot it on the face and neck as shown on the back of the bottle. Massage for 10-15 seconds. Since it contains AHA, it might cause some redness or irritation to the extremely sensitive skin. It does not cause any adverse reactions on my skin. This moisturizer comes in a light yellow plastic bottle. The bottle has pump dispenser with the lock mechanism. The packaging is very user-friendly, travel-safe and hygienic. Alphamoist moisturizer is a white colored lotion with a light consistency. It takes 2 pump product to cover my face and neck. It has a mattifying formula that settles into a comfortable matte finish after 1-2 minutes of application. It has a very mild scent with a citrus hint. The fragrance is not long lasting or bothersome. After a couple of minutes, my face becomes completely fragrance-free. In summer my combination skin stays on the oily side. I opt for light moisturizers during the humid months. This AHA based moisturizer used to be a favorite in my teenage days so I bought this again. Since this has AHA which makes the skin matte and dry, I use non-drying face cleansers with this moisturizer. It does not irritate my skin and after using it continuously 2 times a day for 4 weeks my skin is behaving quite well. The dullness issue is resolved and there is a healthy nourished feel. It did not give any redness or acne. The clogged pore bumps are gone as well! What do I like about this moisturizer? What I dislike about this moisturizer? This bottle is a repurchase and I am going to do more ‘repurchases’ in future. I would suggest this to someone looking for moisturizers with natural AHA. Lotus Herbals Lemonpure Cleansing Milk – Should You Buy This? Lotus Herbals Aloe Soft SPF 20 : Best Body Lotion For Summers ? Lakme Blush and Glow Face Wash With Peach Extracts – Is it A Good Buy ? L.A Girl Lipstick Runway – Beautiful Matte Maroon Lipstick !